The Wilson Staff Exo golf cart bag provides a secure fit on a trolley or buggy thanks to its solid base with a trolley anchor and has a 27.9cm x 22.9cm (11"×9") top opening and 14 full-length dividers for excellent club management. 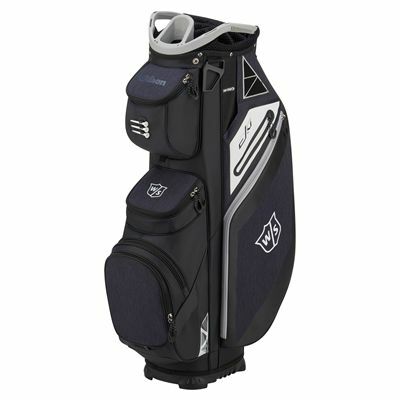 This functional, full-featured bag offers 8 pockets in total to let you comfortably carry your gear and accessories and boasts a large putter well to fit an oversized grip. The bag features a lightweight construction (2.3kg) and uses Dry-Tech technology in 2 pockets to ensure water-resistance and great protection of valuables. It includes a glove holder, a towel ring, a rain hood and a front umbrella holder to keep your equipment dry during rainy weather. for submitting product information about Wilson Staff Exo Golf Cart Bag We aim to answer all questions within 2-3 days. for submitting product information about Wilson Staff Exo Golf Cart Bag. We aim to answer all questions within 2-3 days. If you provided your name and email address, we will email you as soon as the answer is published. for submitting product review about Wilson Staff Exo Golf Cart Bag.